Everyone wants a magic bullet or something that will, in one fell swoop, stop aging or prolong life. As of yet, there is no one easy solution to all that ails us, but there are certain things when administered thoughtfully with professional advice may have some benefit. Probiotics may be one of these items. Probiotics (literally “in favor of life”) are living organisms intentionally introduced to provide a beneficial effect. As far back as 1910, an early scientist named Elie Metchnikoff proposed that the probiotic diets of Balkan villagers allowed them to live longer than other groups1. The villagers regularly ingested sour milk (early yogurt) that had been fermented with lactobacillus spp and Metchnikoff hypothesized that the lactic acid produced by the fermentation was able to inhibit bacteria in the colon that produce harmful substances 2. He believed that inhibiting these destructive chemicals would allow human beings to live a full life expectancy (which he thought to be 100 years). Of course, there were other factors associated with longevity in the Balkan villagers including daily exercise, moderate diet, and high quality rest. Unfortunately, Metchnikoff’s theories were not able to extend his own life past the age of 71 years when he died from cardiac failure. RELATED: Which canine probiotic does iHeartDogs recommend? His inability to become a centenarian himself does not mean there is no value in probiotics, however. Recent studies have suggested some unexpected benefits that may be associated with probiotic administration in dogs. Specific probiotic preparations did seem to improve test results for dogs suffering from long term intestinal issues. Disorders, like inflammatory bowel disease and food intolerance, are fairly common in pet dogs and this potential benefit is very exciting and may hold promise in the treatment of these frustrating issues 3. Another promising study followed dogs in a shelter environment and found a positive effect from probiotic administration in these patients predisposed to stress diarrhea 4. The effect of oral probiotics for intestinal disease may seem intuitive since the action appears to be inside the intestine, but a recent study also suggested that there could be a role for probiotics in the prevention and treatment of Canine Atopic Dermatitis5. Atopy (inhalant allergy),causing itching and skin infections in pet dogs, is a common disorder. It is one of the top 10 most common claims in a pet insurance survey. Certainly more study is indicated and all probiotic supplements must be reviewed by your own veterinarian. All homeopathic products are not the same and since they are not regulated by the FDA, the risk is much higher with these supplements than other pet products and diets. Probiotics may hold promise in improving health for our beloved dogs, but be a savvy consumer. If it sounds too good to be true, it probably is and ALWAYS ask your own vet for advice on anything you feed your pets. 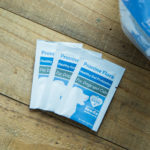 Editor’s Note: The iHeartDogs recently completed the formulation of what we believe to be the most complete canine probiotic on the market, Pronine ™ Flora. The product is a 4-in-1, including probiotics, prebiotics, digestive enzymes, and herbs. You can learn more about Pronine here. Mackowiak, Philip A. “Recycling Metchnikoff: Probiotics, the Intestinal Microbiome and the Quest for Long Life.”Frontiers in Public Health 1 (2013): 52. PMC. Web. 5 Apr. 2017. Metchnikoff E. In: Mitchell PC, editor. editor.The Prolongation of Life. Optimistic Studies. New York: G P Putnam’s Sons; (1910). 96 p.
Schmitz S, Werling D, Allenspach K. Effects of ex-vivo and in-vivo treatment with probiotics on the inflammasome in dogs with chronic enteropathy. PLoS One. 2015 Mar 23;10(3):e0120779. doi: 10.1371/journal.pone.0120779. eCollection 2015 Mar 23. PubMed PMID: 25799280; PubMed Central PMCID: PMC4370582. Rose L, Rose J, Gosling S, Holmes M. Efficacy of a Probiotic-Prebiotic Supplement on Incidence of Diarrhea in a Dog Shelter: A Randomized, Double-Blind, Placebo-Controlled Trial. J Vet Intern Med. 2017 Mar;31(2):377-382. doi: 10.1111/jvim.14666. Epub 2017 Feb 10. PubMed PMID: 28186660; PubMed Central PMCID: PMC5354029. Kim H, Rather IA, Kim H, Kim S, Kim T, Jang J, Seo J, Lim J, Park YH. A Double-Blind, Placebo Controlled-Trial of a Probiotic Strain Lactobacillus sakei Probio-65 for the Prevention of Canine Atopic Dermatitis. J Microbiol Biotechnol. 2015 Nov;25(11):1966-9. doi: 10.4014/jmb.1506.06065. PubMed PMID: 26282691.